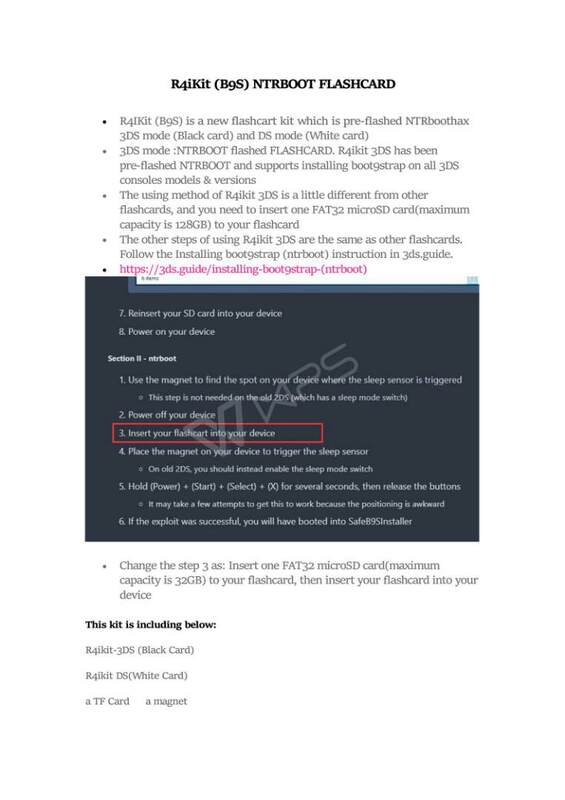 DS devices :: R4i-Kit B9S - NTRboot Ready - ModChipsDirect :: North Americas #1 Mod Chip Reseller! Comes with 2 x Flash cards, a TF card with files on there and a magnet to activate sleep mode. 1. Put a microSD into the grey card. Put it into the 3ds. 2. Place the following files onto the 3ds SD card. 3. Turn the 3ds on and place the magnet around the ABXY buttons such that the 3ds goes to sleep and stays asleep. Turn 3ds off. 4. Without moving the magnet, hold down START, SELECT, and X. THEN press power and continue holding all buttons for 3 seconds. 5. By now you should be in safeB9Sinstaller and just follow its directions. 6. After B9S is intalled, get luma3ds and put the boot.firm on the SD card. 7. Continue with getting all the files set up. Step 2: Copy all files to the root of the SD card.